Few days to go and the world will witness one of the most awaited rematch in boxing history - the Pacquiao vs. Marquez 3 which will be happening at the MGM Grand Arena, Las Vegas, Nevada. 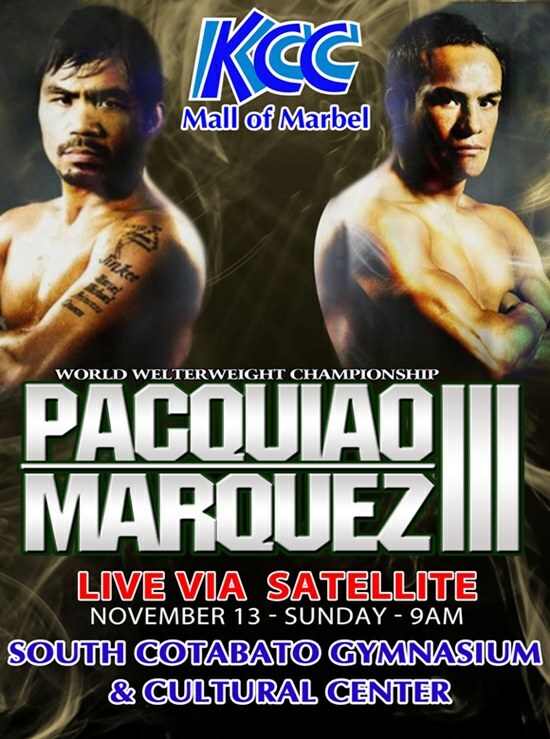 South Cotabato, get ready to watch the Pacquiao vs. Marquez' thrilling bout on a giant screen and enjoy a commercial-free viewing as KCC Mall of Marbel presents Pacquiao vs. Marquez 3 live via-satellite at the South Cotabato Gym and Cultural Center on November 13, 2011. The Pacquiao vs. Marquez 3 will surely confirm who the great warrior is amongst these two. Their first met up was a draw and been so controversial since Marquez fall down 3 times in the first round. But with Marquez’s raging skills and heart to win the fight, his comeback was remarkable up to the last round. The 2nd Pacquiao vs. Marquez fight which happened last March 15, 2008 was a split decision in favor of Manny Pacquiao making him the new WBC Super featherweight Champion of the world. The judges favored Pacquiao based primarily on his aggressiveness and gut. His best moment was in Round 3 when he knocked down Juan Manuel Marquez leaving the Mexican dizzy after the round even forgetting where his right corner was. But again, the Mexican fighter showed strong spirit and believed he should have won the fight. Don’t miss the Pacquiao vs. Marquez 3, shop now at KCC Mall of Marbel to get your FREE tickets!